When a building is moved today, it is a rare sight, so it is a pretty big event. But 100+ years ago, moving buildings was very common. After all, it took a lot of time to build a building, and New Englanders are known for their frugality, so why waste a perfectly good structure? I think it might surprise people to hear that one large, significant building, no longer standing, was moved in Springfield in 1911: the old city library. When you think about it, it makes some sense to move the library. It occupied a very desirable spot on State Street. It had a collection of at least 50,000 books, where would those be stored? And if it was closed for the construction of the new library, what would the public do? But I can understand that people are skeptical of my story, so I've assembled some proof. 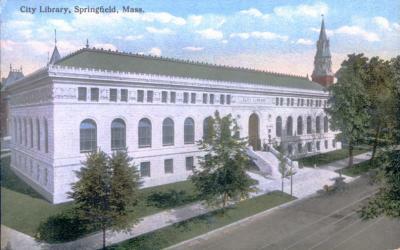 Here's a postcard of the current Springfield library from around 1911. Take a look at the left side. What do you see in the background, peeking over the top of the new library? It sure looks like the turret of the old library, doesn't it? 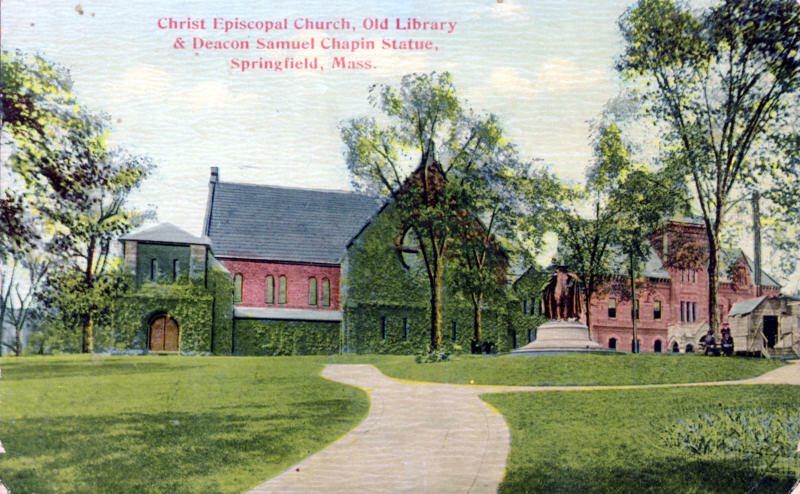 The postcard is entitled "Christ Episcopal Church, Old Library & Deacon Samuel Chapin Statue, Springfield Mass." They wouldn't call it "old library" if there wasn't a new library in people's minds. And if you look at where this library is standing, it is no longer on State Street: it is clearly pushed further back in the Quadrangle. If you look at the lower right, you'll see what appears to be some kind of construction shed. It would seem the photo used as the basis for this postcard was taken during the construction phase. The evidence is quite clear: the old library was moved back into the Quadrangle and the present-day library was constructed on its highly desirable lot. If the planets ever align and I get copious free time, if the Connecticut Valley Historical Museum gets better hours, or if the Springfield Republican puts its archives online, I might just find an old newspaper article on this, because even though moving buildings was commonplace in that era, I have to believe that moving libraries was not. Thanks to Jim Boone for the idea for this story. Thanks to Ben Murphy, who found an article in a 1962 City Library Bulletin describing the move which had occurred 50 years earlier. I've reprinted it below (sorry, no author was credited). The beauty of the new building was apparent while it was going up, with its pure white marble hand-cut blocks. Almost at once however an acrimonious dispute broke out, some declaring that white marble was notoriously soft, utterly unfit for building – that this, in fact, was so soft a man could bite it: and that it would start to crumble away in 15 to 25 years, It seems these critics were wrong. 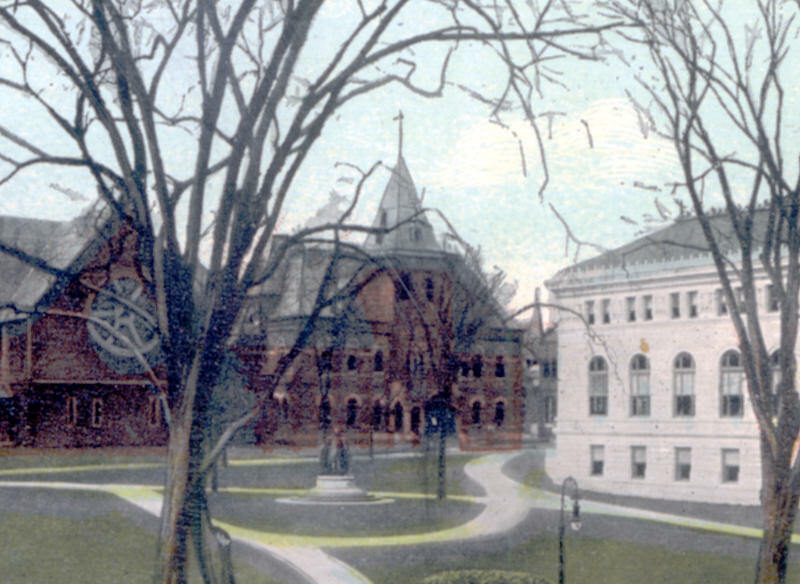 The building, the modern plans, and the public-spiritedness so evident in the residents of Springfield caused Andrew Carnegie to increase his donations toward it twice, with no conditions attached – which was unprecedented. The plans incorporated all the very latest ideas for a library, including easy access from the street and book shelves open to the patrons, and librarians came from as far as Ontario to study it. At last it was finished, and truly beautiful: Italian Renaissance in style (to go with the George Walter Vincent Smith Art Museum), with a pink granite base from Grand Isle, Maine: the “finest obtainable” white marble from Rutland, Vermont; a decorative band over this of terra cotta, and a green tile roof topping it. It was freely acknowledge one of the finest buildings of its kind in the country. On January 10th, 1912, the dedication exercises were held. Then came moving day for the books. A trestle – apparently Mr. Wellman’s own idea –was built between the second floor of the old building to the main floor of the new, a distance of 125 feet. It was variously described as a conveyer belt, a “jinnyroad”, cable cars “like Mt. Tom’s”, a special inclined gravity railroad. Anyway two boxes or “cars” 6 feet long by 2 ½ feet wide were attached by a circular cable, the loaded one going down pulling the empty one up, with a man operating, a friction brake at the top. Pages and staff at both ends (while others waited on borrowers) made the books fly, as they loaded the car with books at the top – in perfect library order of course, - and unloaded them at the bottom and put them right on their proper shelves. The only books you could not take out were those in transit at the moment. I'm glad to see that my original idea for this blog has worked -- people contributing to an account of Springfield's history online. Thanks! Submitted by Barbara Shaffer (not verified) on Mon, 09/10/2007 - 13:36. You have presented a fascinating mystery. I wonder if the old library was moved in order to store the library collection until the construction of the new library was completed? Submitted by Jane Wyatt (not verified) on Mon, 09/10/2007 - 15:55. Your next assignment is to find out why the top floor was removed from Forest Park Junior High, not many years after its' completion. No one seem to know why this was done. Thank you. Submitted by Anonymous (not verified) on Wed, 11/11/2015 - 22:06. MANY SCHOOLS IN THE DAY HAD MORE THAN 2 FLOORS BUT EVENTUALLY BECAME TO BE KNOWN AS FIRE TRAPS. WHEN FUNDS BECAME AVAILABLE DURING THE DEPRESSION, THE 3RD FLOOR WAS REMOVED. Submitted by Ben (not verified) on Wed, 09/12/2007 - 09:24. I used to work at the Quad and if you took the elevator behind the circulation desk (not open to the public) up to the fourth floor it opens to a little hallway right off the rotunda. 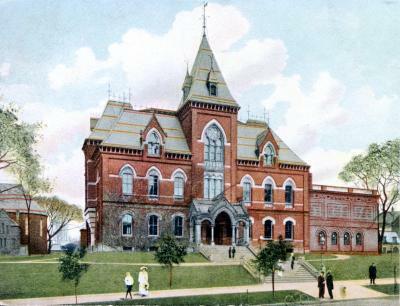 There was a large image of the current library and it clearly shows the old library in the background, similar to the last image on this post. Submitted by Anonymous (not verified) on Wed, 09/12/2007 - 18:07. Years ago when the local history room was a tiny room to the right of the main door of the library, I was given a tour of the local history collection below the main floor. It seems we went down several flights of a "secret" staircase before we reached the collection. What treasures lie hidden away there now? Submitted by Ben (not verified) on Thu, 09/13/2007 - 08:31. I actually worked as a page in the local history and genealogy library at the Conn. Valley His. Museum and they used the space in the lower stacks of the main library for their archives. When the library went through extensive renovations recently the collection was moved off site to make room for the library’s stacks which where moved to make room for the expansion below Rice Hall. (I hope that makes sense) The stacks are basically a very large room below the main floor and behind the periodical room that are split into two floors with lots of shelving. Submitted by Ben (not verified) on Thu, 09/13/2007 - 08:35. My point is the local history collection is no longer in the main library. Ralph, I found an article about the "new library" that has some information on the move of the old library and moving all the books into the "new library". It's very interesting; I'll email you a copy after I type it up. Submitted by Ralph Slate on Thu, 09/13/2007 - 20:39. Thanks Ben -- I look forward to seeing it. This is what my idea for the website was about -- people sharing information on various topics in a public way. Submitted by Anonymous (not verified) on Thu, 09/13/2007 - 11:14. Yes, your post makes sense. I have been to the "new" local history room in the Pynchon building many times. It is one of my favorite places to be but I don't get there often these days. My love of the Quadrangle goes back a long time. What an invaluable resource Springfield has on that plot of land! Submitted by Jim Boone (not verified) on Fri, 09/14/2007 - 09:42. Submitted by Ralph Slate on Fri, 09/14/2007 - 16:00. See the updated article, which now includes a story published in the library bulletin in 1961 describing the move. Thanks! Submitted by Anonymous (not verified) on Sat, 10/27/2007 - 17:56. My father worked at the library when he was in high school and he says that he and another boy painted the buttons on the statue in front of the library and caused a big stir at the time. This would be about 80 years ago. Have you ever heard of anything like this or is he just making it up??? Submitted by rickys (not verified) on Sat, 03/29/2014 - 06:51. Submitted by Anonymous (not verified) on Mon, 10/29/2007 - 09:05. I have never heard this story before, but I think that the wardrobe they enhanced was that of Deacon Samuel Chapin. He's the fellow that stands outside the library today. Submitted by Anonymous (not verified) on Mon, 10/29/2007 - 13:29. You are probably right about the statue, if it is the one right in front of the library. My father is 97 and still pretty sharp but he was just a kid at the time. He thinks it was a statue of a pilgrim. He worked int he library as a page and said that it was just a prank. They were surprised that it was such a big deal and made the newspapers but they never told because they did not want to get in trouble. Submitted by Anonymous (not verified) on Wed, 10/31/2007 - 06:47. Your Dad was born into one of Springfield's brightest eras: a golden age of education (Central High was one of the finest schools in the country), culture (downtown was packed with theatres) and booming industrial growth (Milton Bradley, Bosch, Smith & Wesson, etc.) The library was probably brand new when he worked there. What fantastic memories he must have! Did he know Ted (Dr. Seuss) Geisel? The buttons incident sounds like something he would have instigated. Submitted by Anonymous (not verified) on Wed, 10/31/2007 - 13:04. I don't recall my father talking about Dr Seuss but he just loved working in the library. My grandfather moved around a lot-he was a machinist with the wanderlust. They had come here from England in 1912- but my father says he did get a good education in Springfield and there was always a lot to do there. He was the first of the family to go to college- at RPI in Troy, NY. A lot of his other siblings stayed in the area living in West Springfield, Greenfield and E. Longmeadow and we often went to Forest Park when I ws growing up. My aunt taught secretarial skills at one of the junior colleges for years. They all used to work at the Northfield Inn in Mass every summer to pay for school. Submitted by Anonymous (not verified) on Thu, 11/01/2007 - 11:20. What specifically brought your grandfather from England to Springfield? Rolls Royce reputedly located here because of the fine mechanics in Springfield. Our high schools back then certainly would have well equipped a student for RPI. According to some of the older folks I've talked with, the small towns didn't have high schools of their own and sent the students to Springfield via trolley to attend Central, Commerce, etc. Submitted by Anonymous (not verified) on Fri, 11/02/2007 - 12:35. I asked my father and my grandfather worked all over. Don't know why he picked Springfield but not Rolls Royce. He was a master machinist. I guess he worked at a lot of places in Mass. He worked in Indian Orchard at a place called Fiberloyd or Fiberoid something like that. They also moved to Ashwillet sp? New Hampshire to a paper mill and down to Manchester Connecticut where he worked in a bunch of places. Finally went back to the Fiberlloyd place where he was a foreman and retired from there. Never had any trouble getting a job because he had good qualifications and could do anything and always got good references. He had come to this country ahead of the family and then sent for them. They were supposed to come on the Titanic but my grandmother found out that there was a ship leaving one day sooner so she switched to that one. They were almost to the US when they heard about the Titianic going down. My father was just a baby but my aunt was about 12 so she remembered the whole thing. My father graduated from Central High. Earlier he had gone to school in a lot of places including a one room school house where he got so good an education that they skipped him ahead when he got to the city. At one place in the country they got to school on sleighs in the winter. My one uncle went to trade school and became a teacher at one around Danbury and the other went to Umass and became a guidance counselor at Longmeadow High for many years. Aunt taught at Springfield Jr College (I think). My father became an engineer and also traveled all over New England for work. As for the library moving thing, he says the old library was right near where the new one was so they were around at the same time. He thinks it may have been a museum. He worked in the "new" library but I think it was before Dr Suess became famous. Submitted by Anonymous (not verified) on Sat, 11/03/2007 - 17:46. Fiberloid was, I believe, a pioneer in plastics and located in the Indian Orchard section of Springfield. Sometime in the 30's, Monsanto took over the company. Ted Geisel aka Dr. Seuss was born in 1904 in Springfield. He would have been a little older than your father and you are correct that he became famous much further down the road. Nonetheless, he was a student at Central and reputedly spent a lot of time at the new library. What a fortunate turn of events about your grandmother's journey here! There was at least one Springfield resident aboard the fateful Titanic. A young man named Long, I think, but his full name escapes me. Submitted by Anonymous (not verified) on Mon, 04/15/2013 - 15:18. Very interesting reading of the old Springfield Library. Does this building still exist? More information would be appreciated. Many thanks. Submitted by Anonymous (not verified) on Wed, 12/31/2014 - 12:44. I am filing sorting old papers from my family (french). I discovered several letters from a friend of my grand father Georges WILLOT about this moving. Which required 22 couples of bulls ... and 4 elephants. Should you like copies (in french) let me know. Submitted by Azalee States (not verified) on Sat, 03/16/2019 - 08:26. Fine way of explaining, and fastidious piece of writing to take data on the topic of my presentation subject, which i am going to present in academy.